Place the potatoes in a large saucepot covered with water. Bring to a boil over medium high heat. Reduce the heat to a simmer and cook for about 15 minutes until tender when pierced with a fork. The cooking time may vary according to the size of the potatoes. Remove the pan from the water and add 2 tablespoons of kosher salt and let stand for 5 minutes so that potatoes can absorb some salt. Meanwhile, mix the yogurt, tahini, and lemon juice in a mixing bowl with a whisk until well combined. Season well with salt to taste and set aside. Place the pan in the sink and run cold water over the potatoes until they chill through, about 5 minutes on a low stream. Drain the water when cool and cut the potatoes in half. Place the potatoes in a bowl and season them with salt to taste. Stir in the olive oil and set aside. Pre-heat oven to 375°F or prepare a charcoal grill. Tear off a piece of parchment paper measuring approximately 14 inches long. Slice the potatoes in half and place 6 to 8 halves in the center of the parchment and wrap the potatoes up into a tight little package. Twist the top so that the bag is airtight and it looks like a little balloon. Wrap the paper with foil if you are using a charcoal grill. Repeat until all the potatoes are wrapped in paper parcels. Place them on a baking sheet and then into the oven to steam for about 15 minutes or until hot. If using a charcoal grill, you can place them right onto the grill and they will take 6 to 8 minutes to get steamy and they might brown nicely on the bottom. When the potatoes are hot, remove the foil if using and cut the top of the bag open. 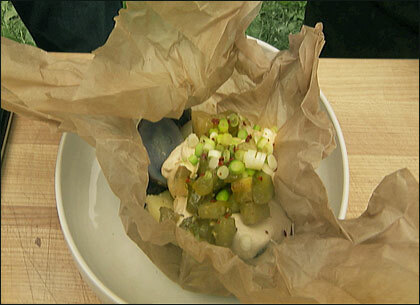 Top each bag of potatoes with 2 tablespoons of the tahini yogurt mixture and 2 tablespoons of green tomato jam. Sprinkle generously with scallions and serve. In a small sauté pan, bring the honey, water, and wine to a simmer on medium-low heat. Add bay leaf, garlic, and thyme and simmer for 3 minutes. Stir in tomatoes and season with salt. Reduce the heat to low and simmer the green tomatoes slowly for about 20 to 25 minutes (add more wine or water if the pan dries up too quickly) or until the tomatoes are soft and jam-like. Stir in olive oil and lemon juice. Season again with salt to taste. Cool and remove thyme sprigs and bay leaf. This segment appears in show #3302.